A stormy night is forecast for SE Texas with a slight chance of severe weather. The rains will be out of the area by mid-morning Thursday. Gorgeous weather is then forecast Friday through the weekend with abundant sunshine, lows in the lower 60's with high in the lower/middle 80's. 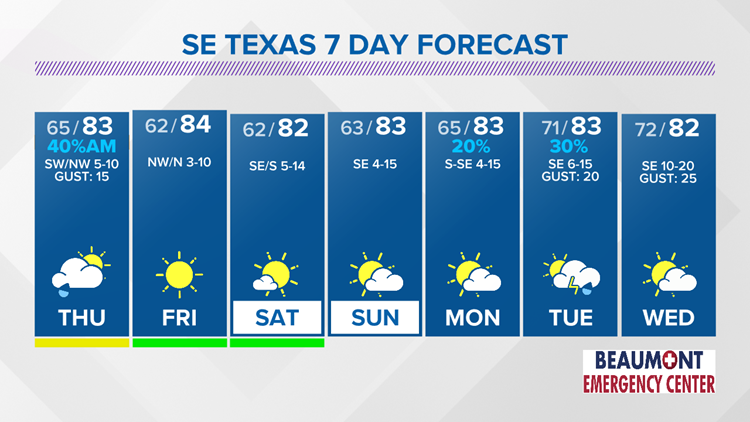 A round of stormy weather is forecast Tonight into Thursday Morning, but this will then bring another outstanding weekend weather wise in SE Texas. A Slight Risk of severe weather is possible later tonight due to a line of thunderstorms with wind damage the main threat. A 40% coverage of morning showers is forecast Thursday, however mostly sunny skies and warm afternoon temperatures are expected. Friday through the weekend looks outstanding with abundant sunshine, warm afternoons and cool mornings. A few showers and thunderstorms return to the forecast Monday and Tuesday. Triangle Tonight: Mostly cloudy, 80% coverage of late-night showers and thunderstorms. Low near 65° in Beaumont, 65° Orange and 67° at Port Arthur. Winds: Southeast becoming Southwest 6-15 mph with gusts to 25 mph. Lakes Area Tonight: Mostly cloudy, 90% coverage of late-night showers and thunderstorms. Low near: 64°. Winds: Southeast 3-10 mph. Triangle Thursday: 40% coverage of morning showers becoming mostly sunny, warm and dry during the afternoon. High near: 83° in Beaumont, near 81° in Orange and near 82° in Port Arthur. Winds: Southwest shifting Northwest 5-10 mph with gusts to 15 mph. Lakes Area Thursday: 40% coverage of morning showers becoming mostly sunny, warm and dry during the afternoon. High near: 82°. Winds: Southwest shifting Northwest 3-10 mph. Friday (4/26): Sunny, warm and dry with lower humidity. Low near: 62. High near 84°. Winds: North 4-15 mph. Saturday (4/27): Mostly sunny and dry. Low near: 62°. High near: 82°. Winds: Southeast becoming South 5-12 mph. Sunday (4/28): Mostly sunny to partly cloudy, mild and dry. Low near: 63°. High near: 83°. Winds: Southeast becoming South 4-15 mph. Monday (4/29): Partly sunny, warm and breezy, 20% coverage of showers. Low near: 65°. High near: 83°. Winds: Southeast becoming South 6-15 mph. Tuesday (4/30): Partly sunny, warm and humid with a 30% coverage of shower and thunderstorms. Low near: 71°. High near: 83°. Winds: Southeast 6-15 mph with gusts to 20 mph. Wednesday (5/1): Partly sunny, warm, humid and breezy. Low near: 72°. High near: 82°. Winds: Southeast 10-20 mph with gusts to 25 mph.